Blue Note - Ready Steady Gone! 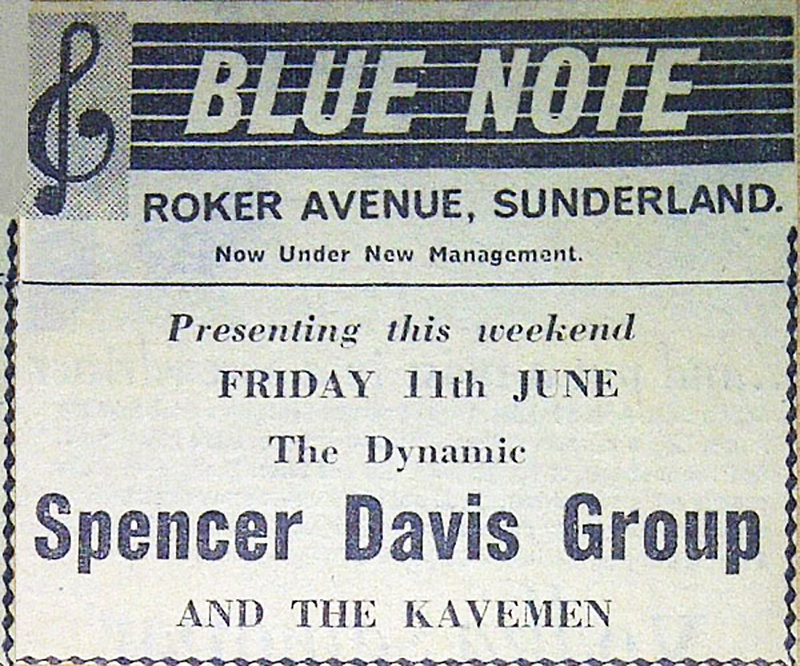 The Blue Note Club at 174a Roker Avenue, Sunderland was a popular venue in the mid sixties but it was fairly short lived. Although some of the top touring bands of the era appeared there to packed audiences in the twelve months or so that it was open, the Blue Note attracted some bad publicity which ultimately led to problems when it came to the renewal of its license. 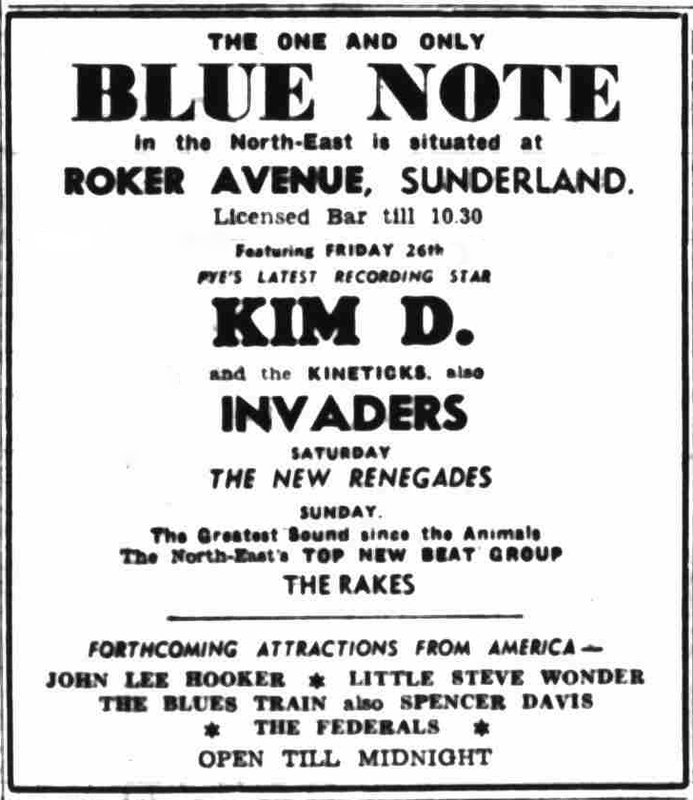 The Blue Note was opened in September 1964 by a business man named Ray Grehan, who was involved in several other music ventures in the North East. Even though the club was licensed, its target audience was teenagers. It became known as a ‘booze & beat’ club. 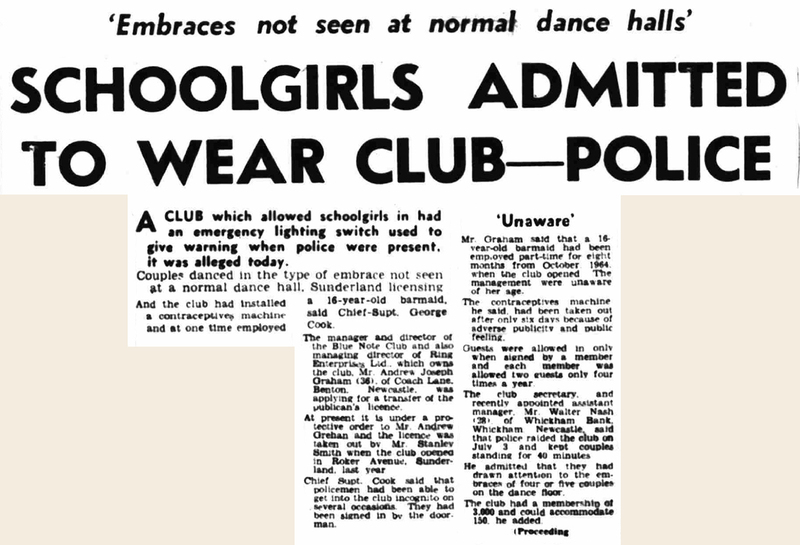 Although there were other licensed clubs in Sunderland at the time, such as Club 11 and La Cubana, they tended to attract an older clientele. The main room in the club was housed on the first floor of a large building, which was part of a terrace of houses and shops on the South side of Roker Avenue, not far from its junction with Church Street North. As well as local bands, well know national bands were booked to appear – the likes of the Mindbenders, Alex Harvey Soul Band and the Pretty Things. I played at the Blue Note a couple of times with the Kylastrons early in 1965. On one of these occasions I saw the Junco Partners for the first time. 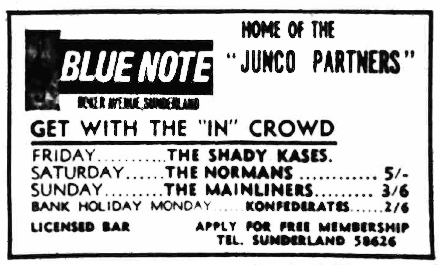 The Junco Partners who had made their name at the Club a’Gogo in Newcastle were also extremely popular at the Blue Note. At that point in time they were the best band I had seen. They were all great musicians and the two singers, Ronnie Barker and John Anderson gave the band a charisma and energy that no other North East bands could touch. The following day Ray Grehan was interviewed by the Journal and pledged to have the contraceptive machine removed. But the damage was done and the matter came back to bite him later in the year when the club’s license came up for renewal. In the months following the Journal’s articles, the club was raided several times by police looking for under-aged drinkers and drugs. In September 1965 when Ray Grehan applied to have the Blue Note license renewed in his name, the police objected. 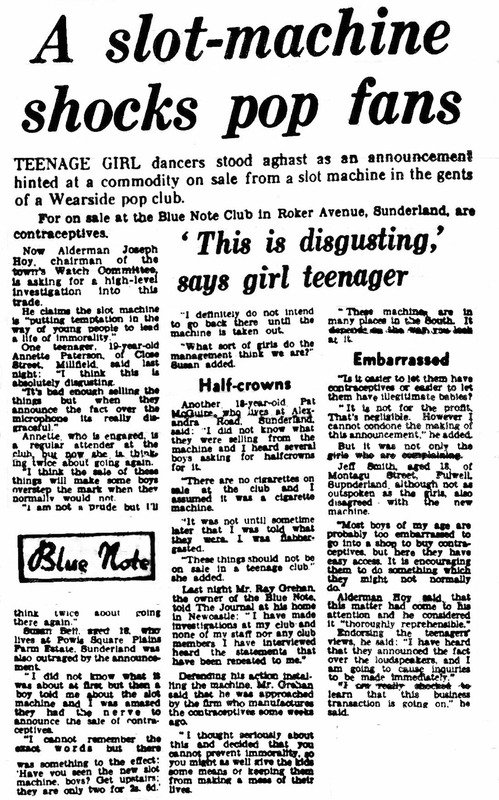 The contraceptive dispenser incident, the fact that a 16 year old girl had been employed as a barmaid and that schoolgirls were admitted to the club were all things brought up by the police in their objection to the license renewal. 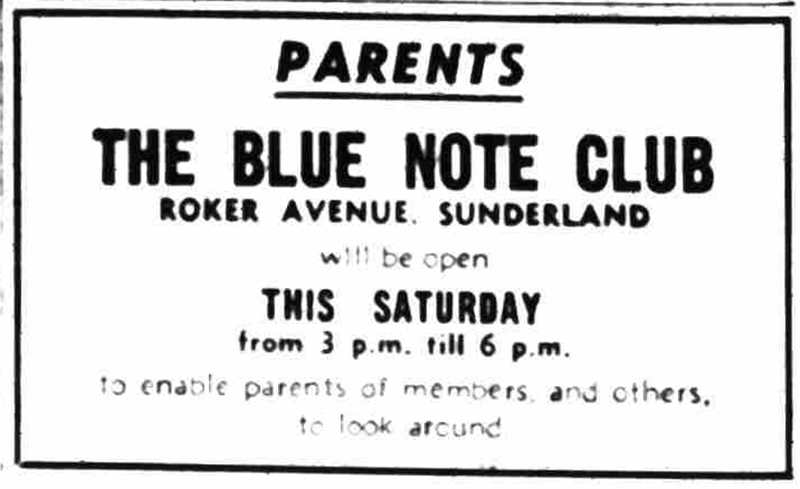 In an attempt to convince the public that the Blue Note was not a den of iniquity, Ray Grehan placed an advert in the local press inviting parents to visit the club and look around. In spite of protests by regular club goers and Ray Grehan’s efforts to get the general public on his side, the club was forced to close. The Sunday Sun went on to say that ‘the machine had to go but Ray Grehan was left with the stock. One night he arrived at the club to find the DJ giving two away with every pint. Ray commented that at the time he was pilloried whereas in more recent times he’d probably get a medal’. After the Blue Note, John Harker went on to be a popular DJ in many of the North East’s clubs. He appeared in the eighties TV music show, ‘The Tube’ as resident DJ. Sadly, John died in 2008. I’m not sure of the exact date when the Blue Note actually closed its doors but it reopened as an unlicensed venue in the spring of 1966 and its name was changed to Club Astec. Business was brisk in the summer of 1966, in particular during the period that some of the World Cup games were being played at Roker Park. I played regularly at the Astec with the Jazzboard and a lot of the crowd from the el Cubana came to see us at the club. Another popular Sunderland band that performed regularly at the Astec were Revolutionary Spirit. However the club lacked the atmosphere of its predecessor, the Blue Note and attendances fell off. 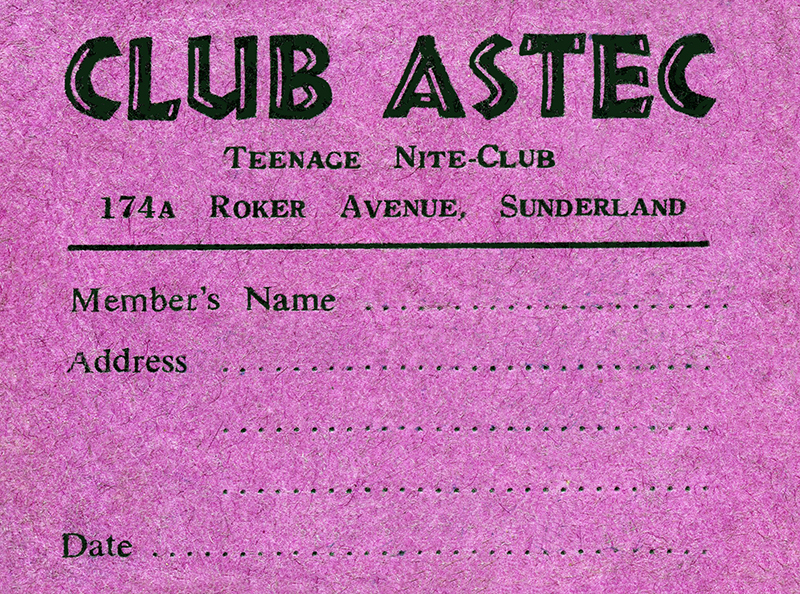 The Club Astec did not last too long as an unlicensed venue. Worked there from it's fisrt night, to the end, along with Mickey Turley, who worked as dj at the Mecca at the same time. Opened by guys fronm South Shields (can't for the life of me remember their names) - real good guys but not business men. Anth Charlton worked door.